This blog post describes features unique to Quest and identifies business cases where this game type will work well. 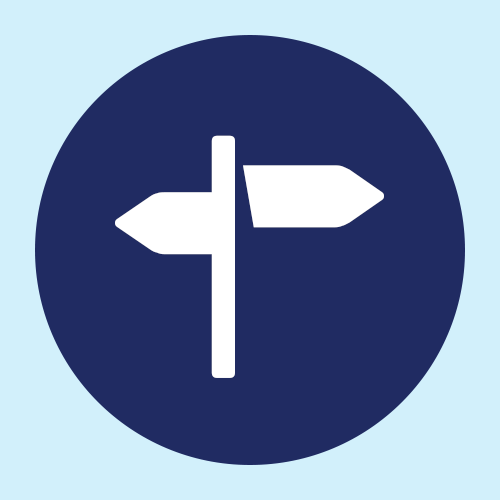 Quest, Legend, and Drive game types are all suited to different training needs and situations. In some cases; the choice becomes one of personal preference. Click through the slideshow to see a quick visual summary of the key features unique to a Quest player experience. A quicker entry into the game. Legend has a story associated with every theme. Drive has players complete a confidence assessment. Quest does neither of these things. 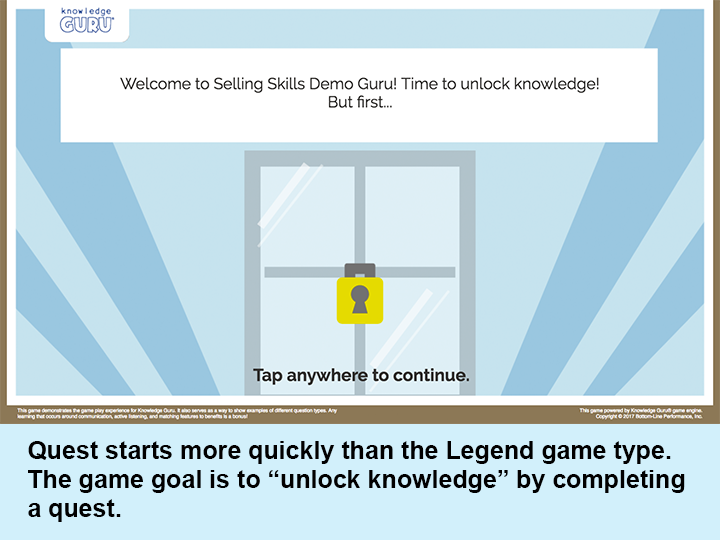 The game goal is to unlock knowledge by completing a quest. The ability for the player to select an avatar. We’ve created 12 different game pieces or avatars for players to choose from, depending on the theme you choose. Players get to select one of these characters or game pieces to represent them as they complete their quest. 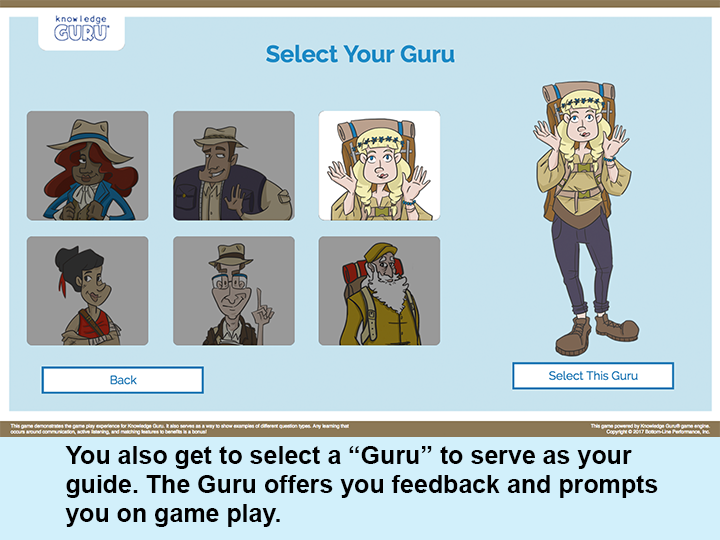 The ability for the player to select a personal “Guru” to accompany the player on the quest. There are six Gurus to choose from. 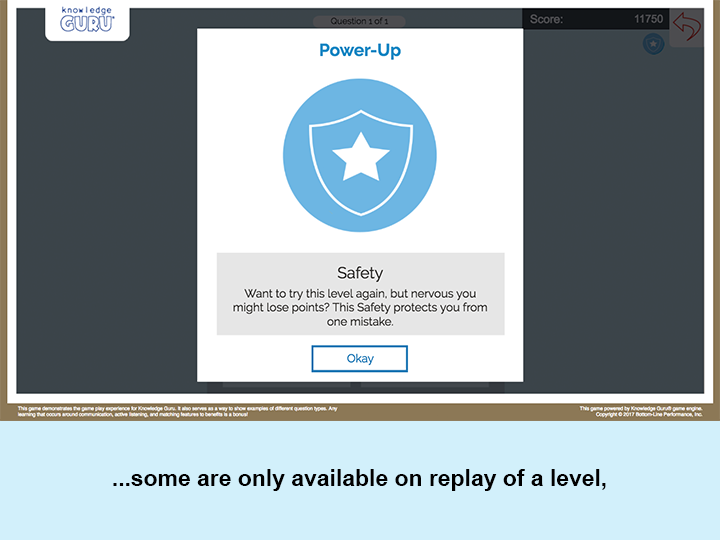 The use of levels and star rankings to encourage replay of levels that a player did not do well on. There is no “grab bag” in a Quest game as there is in a Legend game. Instead, we encourage additional repetition through the star rankings. 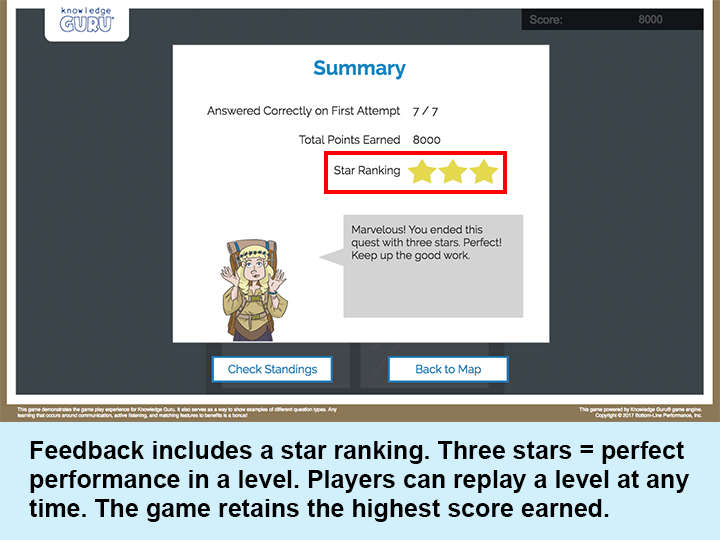 Most players will want to achieve 3-star performance. Few will want to settle for 1-star performance. 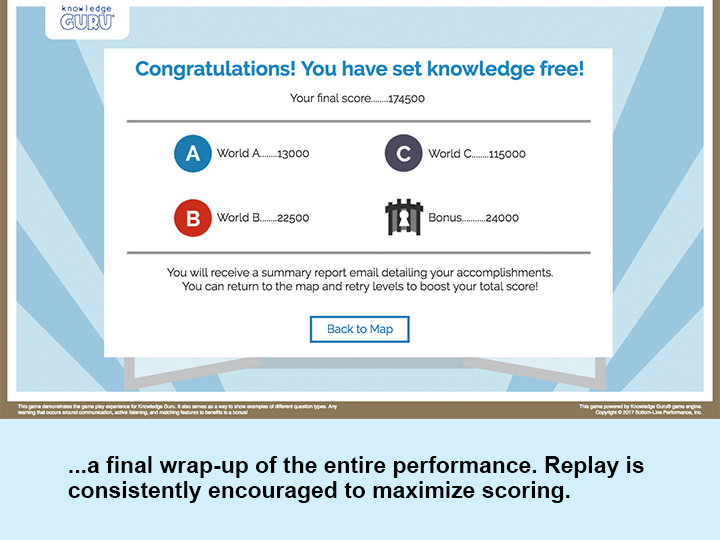 The inclusion of “Performance Challenges.” These extend the game play experience beyond recall of knowledge or application of knowledge to specific job scenarios. 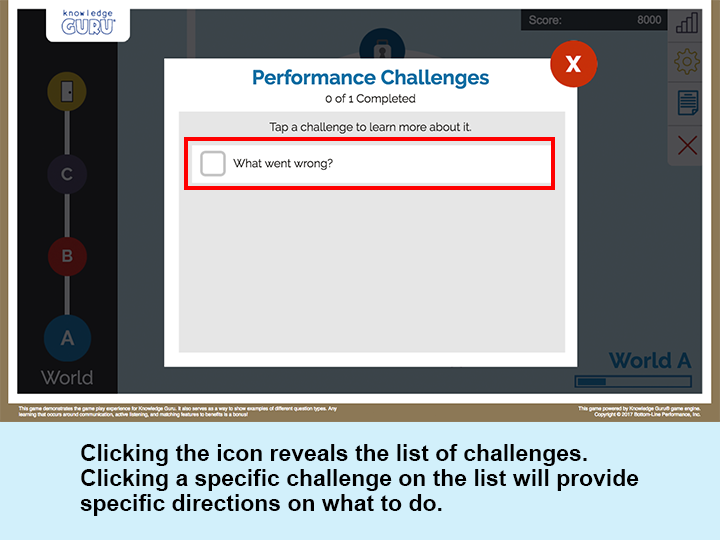 Performance Challenges can be a variety of things, but will often include some type of skill practice or skill demonstration the learner needs to do. You can get creative with what you include. These challenges do not HAVE to be included in a Quest game, but they are a feature unique to the Quest game type. For more information on these, check out the blog on how to create them. 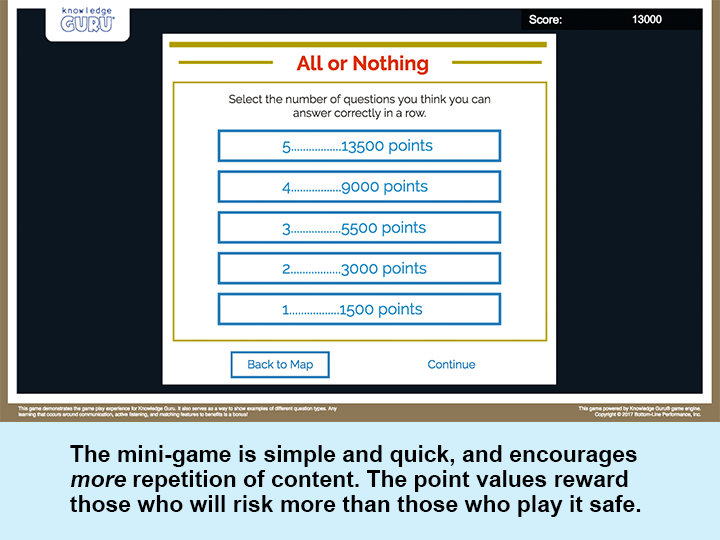 Different game “spacing” of learning content. Both Legend and Quest (and to some extent, Drive) use the instructional techniques of spacing and repetition. 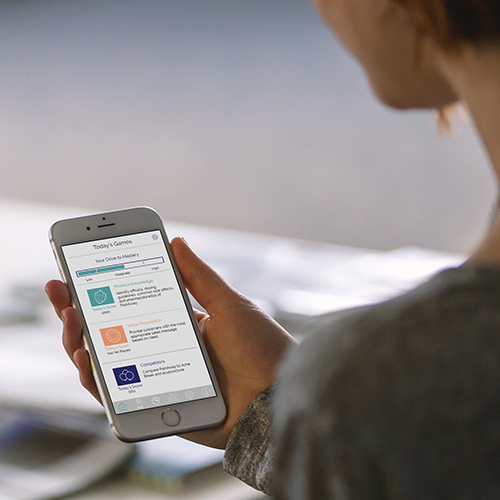 Quest does it differently than Legend – increasing the spacing between repetitions of content. 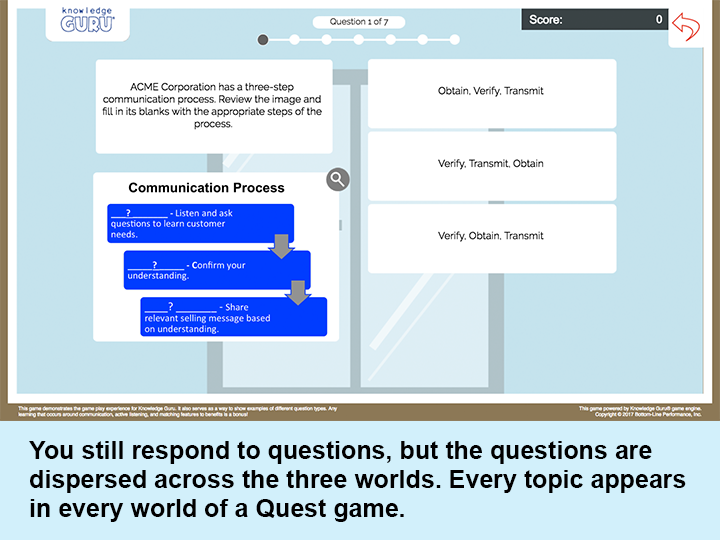 In Quest, the “A,” “B” and “C” repetitions of each question associated with a topic are distributed across three Worlds in the game instead of being clustered together. Players go through the “A” version of all game questions in World A. They then progress to World B and respond to all the “B” questions. Finally, they traverse to World “C” for the final repetition. Spacing can be further extended if the game author selects “daily” or “weekly” spacing. Daily Spacing means players complete a single level (the “a” versions of a single topic, for example) per day. If players opt for it, the Guru sends emails to remind them to return to game play. 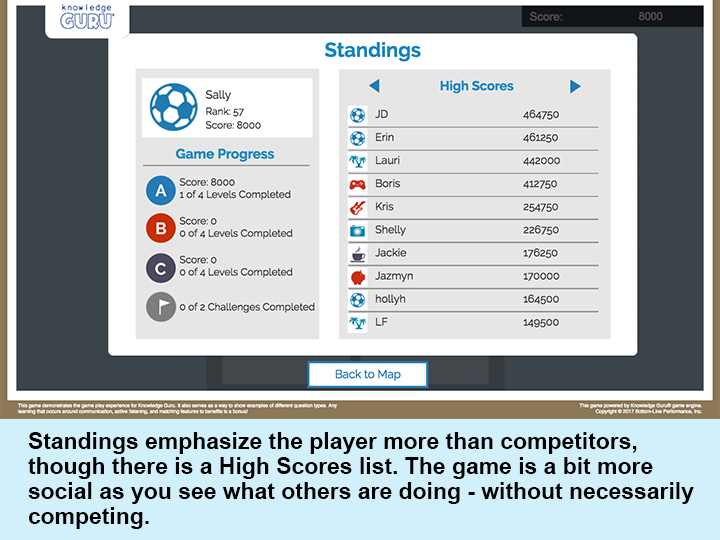 Weekly Spacing means players can complete all the topics in a single World in a week. The next World will not unlock until the start of a new week. 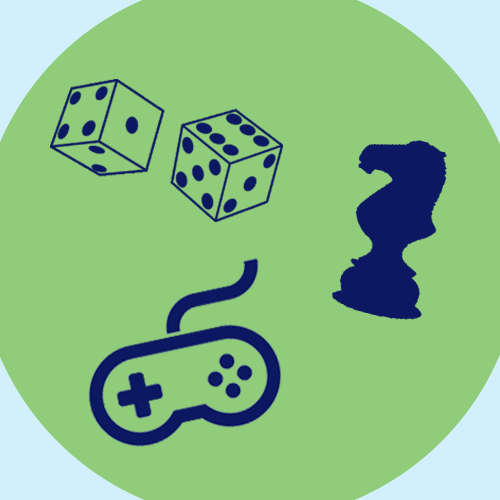 If you have time to allow it, this increased spacing, also known as “distributed practice,” can greatly enhance long-term retention over a single game-play session. If you do NOT have time for it, know that even “micro-spacing,” which is the design of a Legend game is a useful aid for long-term retention. 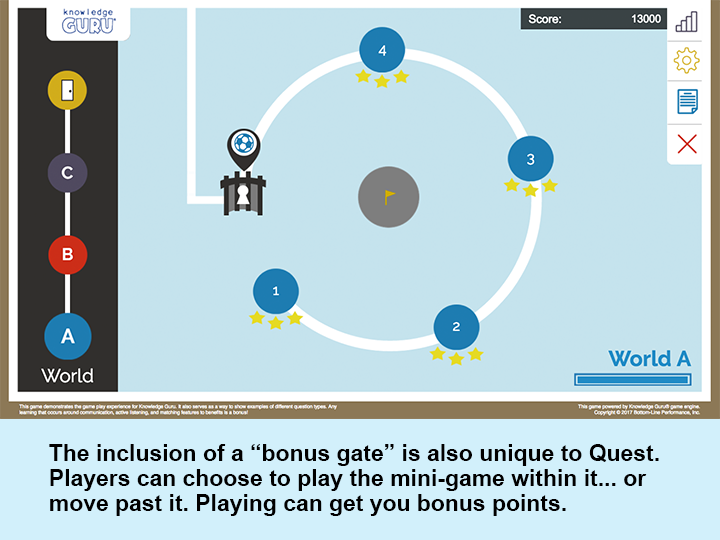 The inclusion of a mini-game, a bonus gate, and power-ups. 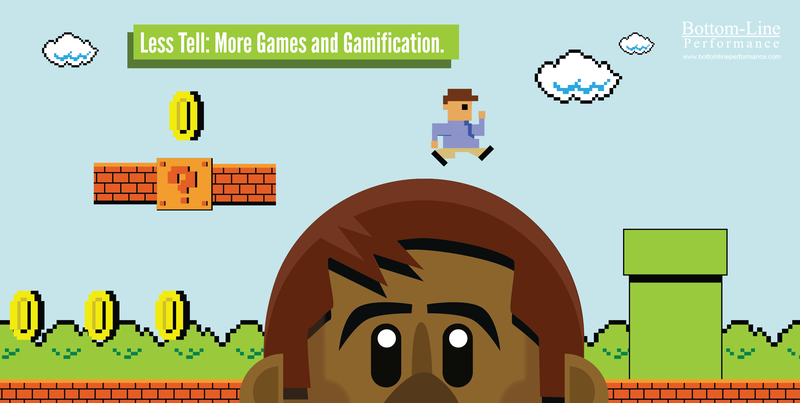 These elements are all designed to enhance player motivation and increase engagement during the learning experience. 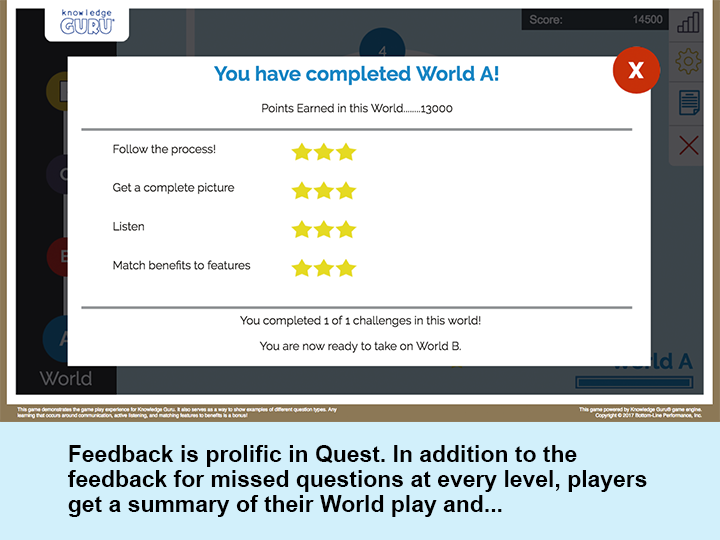 More intensive feedback – feedback is provided after every question, every level, and every World in the game. IE8 is NOT supported. Some companies still hang on to this old browser version, but it prevents us from using higher-quality graphics and slicker interactions. Quest requires IE9 or higher. The benefits are visually very evident if you play through a Legend game and a Quest game, though Legend still looks lovely. So what are strong “use cases” for Quest? These are scenarios where we recommend a Quest game type instead of a Legend game type or a Drive game type. There are other use cases where all three game types are a good option. As a cornerstone of an employee onboarding program focused on helping specific employee groups ramp up. Both Quest and Drive would work well in this use case. A Quest game can incorporate a broad range of topics (up to 7 topics instead of the limit of 4 topics in Legend). It can also allow you to include performance challenges that can help a new employee ramp up to a specific job. 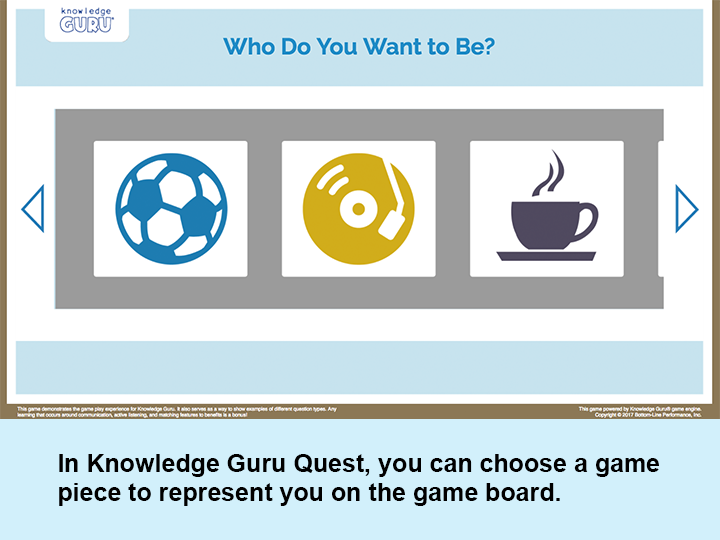 For example, a big box retailer might create a Quest employee onboarding game for new sales associates who will work in specific areas of the store. A bank might create a Quest game to support ramp-up of personal bankers. An accounting firm might want a Quest game for new associates. 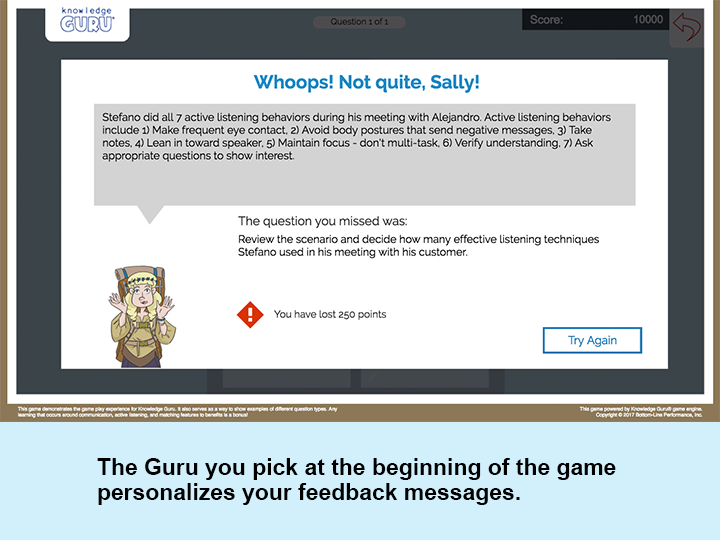 A pharma or medical device company might incorporate a Quest game as part of onboarding new sales associates. 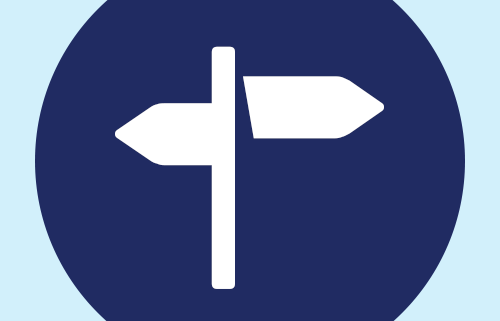 As a component of a multi-day or multi-week training initiative. 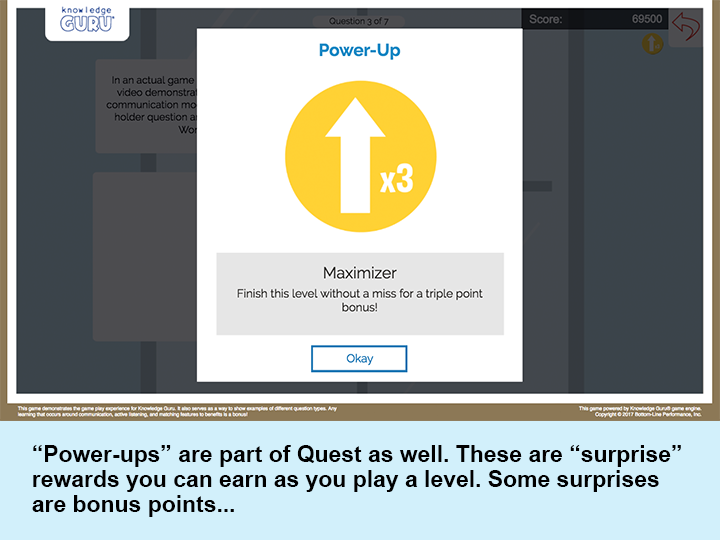 If you provide multi-day training, a Quest game can be a terrific supplement that reinforces content and pushes people to execute skill practice activities. As a steady reinforcement that allows for small “chunks” to be presented on a daily or weekly basis as opposed to a need to do a single “dump” of content. Great examples include call centers, bank personnel, retail personnel, etc. 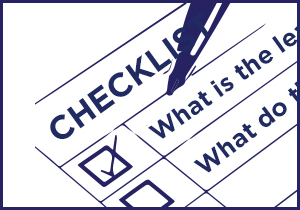 who have very limited amounts of time available for training, but who need constant reinforcement on product information, safety information, policies, etc. A single level in a Quest game can be completed in only a few minutes a day. Drive is also ideal in this scenario. When Should You Use Legend instead of Quest (or Drive)? You don’t have a lot of content. 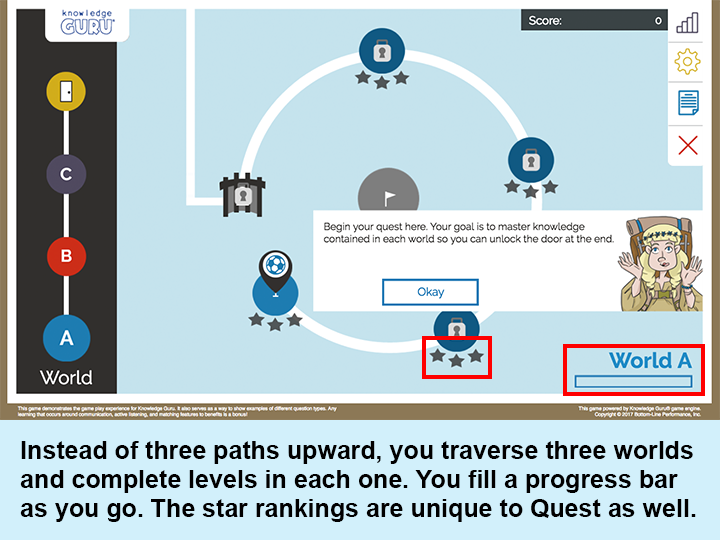 Quest games are designed for 4 to 7 topics. If you have 2 or 3 game topics, you may prefer a Legend game format. You want a single-event game play experience. Quest and Drive are both designed for multi-day or week game play with its inclusion of performance challenges that players execute in addition to responding to game questions. It is set up to provide more “macro” spacing of the repetitions of content. If you want players to complete the game in a single day, Legend is going to be a better game choice. You must support IE8. Quest does not. Check out this article to learn more about optimal uses for a Legend game, or this article for optimal uses of a Drive game.